In celebration of Black History Month, we honor the black unionists who have been monumental figures in progressing workers’ rights. While not a household name, the Reverend Addie L. Wyatt had a major impact on both the labor movement and civil rights movement… Born in 1924 in Brookhaven, Mississippi, Wyatt grew up during a time in which becoming a professional working woman of color was difficult, to say the least. But she never let long odds deter her from pursuing her dreams despite the adversity, discrimination, and sexism that dominated workplaces then. Wyatt’s family moved to Chicago in 1930s because work was scarce in rural towns during Great Depression. By the age of 17, Wyatt was married with two children and decided to join the workforce to support her family. She originally applied to become a typist at a meat packing plant. She met the work requirements, passed the typing tests, and was hired. Despite her skills, Wyatt was put to work canning stewed meat in the back of the factory because black people were not allowed to work in the front offices. Wyatt begrudgingly accepted the position because the pay was decent, and she joined the United Packinghouse Workers of America (UPWA) a year later. To her surprise, the union did not discriminate and while attending the UPWA conferences, Wyatt encountered an array of women and men of all colors discussing workers’ and social issues. Her progressive union encouraged African-Americans to look for leadership roles within the union.. Although Wyatt did not see herself as a leader, her colleagues saw the fierce fighter within and elected Wyatt as their vice president. 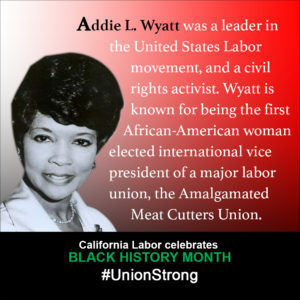 Months after the president resigned, Wyatt became the first black woman to hold senior office in an American labor union. Even though Wyatt was becoming a prominent leader, she found herself “fighting on three fronts”. “I was fighting on behalf of workers, fighting as a black, and fighting as a female,” she recalled. Despite Wyatt’s obstacles as a black female leader in America, she used her personal struggle to push for intersectionality within the workplace. Wyatt had motivated her union to become directly involved with the civil rights and women’s liberation movements. Despite the racial makeup of Wyatt’s union and thanks to her leadership, the UPWA became a donor and advocate of the Montgomery Bus boycotts. Wyatt also successfully fought for “Equal Pay for Equal Work” in her union for all women long before the act passed in 1963. Wyatt consistently and constantly recognized that working people standing together had the power to win victories across social movements. In the early 1960s, Wyatt served as director of the Women’s Affairs and Human Rights departments for the UPWA. She then became the director of the Amalgamated Meat Cutters Union after UPWA merged with their union. Her fearlessness and advocacy caught the attention of former first lady Eleanor Roosevelt, who headed the United States Commission on the Status of Women at the time. Roosevelt appointed Wyatt to the panel’s Labor Legislation Committee. Wyatt’s hard work and determination to eradicate gender wage gaps helped lay the groundwork for passage of the Equal Pay Act of 1963. In the late 1960s, Wyatt turned her attention to the pivotal civil rights movements occurring in the South. Wyatt marched alongside Dr. Martin Luther King Jr. in both Washington, D.C and Selma. She was jailed in Selma for participating in the voting rights protests of 1965. When she wasn’t organizing for her labor union, Wyatt was helping organize protests and marches with Dr. King. Wyatt’s energy in the 1970s focused on creating an accepting and non-discriminatory space for black workers across America. She co-founded the Coalition of Black Trade Unionists to ensure that black workers could “share in the power of the labor movement at every level.” Realizing the intersections between the lack of protections for women and African-Americans, Wyatt became one of the founders of the Coalition of Labor Union Women (CLUW). Wyatt was recognized for her work in the civil rights movement, the feminist movement, and the labor movement by becoming Time magazine’s first black woman of the year, alongside Rep. Barbara Jordan, the first black congresswoman from the deep south. Wyatt continued to break barriers as she became the first African-American female international vice president of the United Food and Commercial Workers in 1976. Although Wyatt retired in the 1980s, she kept active in her community as a reverend and community organizer until her death in 2012.